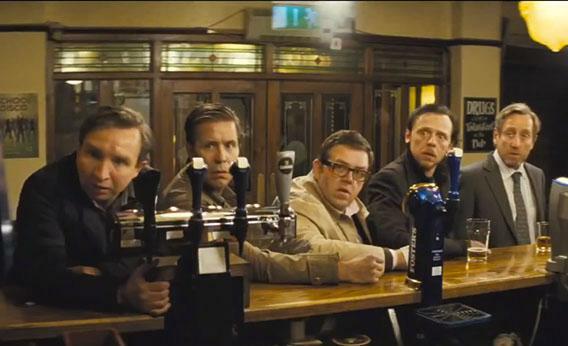 Edgar Wright’s The World’s End, starring Simon Pegg, reviewed. Edgar Wright and Simon Pegg’s best movie yet. It’s the end of the world as they know it. Though they don’t share any characters, the Cornetto films draw from a common pool of actors, including Pegg, his longtime comic collaborator Nick Frost, Bill Nighy, and others. Above all, though, the movies are united by a directorial approach that uses pastiche and parody as storytelling tools rather than just delivery devices for jokes. (Not that all three movies aren’t also bursting with snappy dialogue and rapid-fire visual gags.) Wright sets his sights higher than most comedy directors when it comes to both technical artistry and emotional depth. He can get a laugh from the way he uses the camera, along with what’s happening in front of it, and his characters tend to be more complex and less heroic than your average zombie-outrunning, mystery-solving, alien-slaughtering genre heroes. Though he is only 39 years old, Wright’s punchy, genre-bending style has already been an influence on other English filmmakers, including the comedian-turned-director Joe Cornish, who made the 2011 aliens-in-the-ghetto thriller Attack the Block with Wright as executive producer. That sounds like the setup to an awesome movie even before the alien robots with bright-blue blood come along. Which happens about three pubs in, after the boys have already started to notice some odd things about their old village. First off, none of the residents seem to recognize them—though could that just be because they left town longer ago than they’re willing to admit, and were never as big a part of local legend as they’d like to imagine? The pubs, too, seem different, their grotty individual character subsumed by the chains that have been buying them out and making them depressingly identical. But it’s the blue-blooded robots that seal the deal: Newton Haven is being taken over by some sort of malevolent interplanetary force, and it’s the boys’ job to … save the world? Get the hell out of town? Or should they, on the advice of the charismatic but demented Gary, try to escape alien detection and achieve some ill-defined moral victory by staying the course and finishing the Golden Mile? I think you can deduce from the foregoing that I pretty much unreservedly loved The World’s End, whose compact dramatic structure and steady flow of good jokes puts most mainstream American comedies—too often loosely bundled collections of hit-or-miss sketches—to shame. There are a handful of rough spots in Wright and Pegg’s script. A coda that walks us through the aftermath of the robot invasion felt either too short or altogether unnecessary, and (as was the case with Wright’s last film, the graphic-novel adaptation Scott Pilgrim vs. The World) the fight scenes, however cleverly staged and shot, started to resemble one another after the third or fourth go-round. One might also wish there’d been a more substantial role for the reliably delightful Rosamund Pike, who plays one character’s sister and the object of another’s longtime crush, but who seems to appear only when the bloke-centric narrative absolutely requires it. Still, The World’s End not only makes a more than worthy conclusion to the Cornetto trilogy—it stands on its own as one of the sharpest, saddest and wisest comedies of the year.